It's been ten long years since Hellboy was last on the big screen in Guillermo Del Toro's Hellboy II: The Golden Army, but soon he'll be back in a darker reboot boasting a brand-new star. This time around David Harbour (of Stranger Things fame) will step into Big Red's shoes (and horns), taking over from Ron Perlman and dashing any hopes for a continuation of Del Toro's vision for the series. Here's everything we know so far about the Hellboy movie reboot. 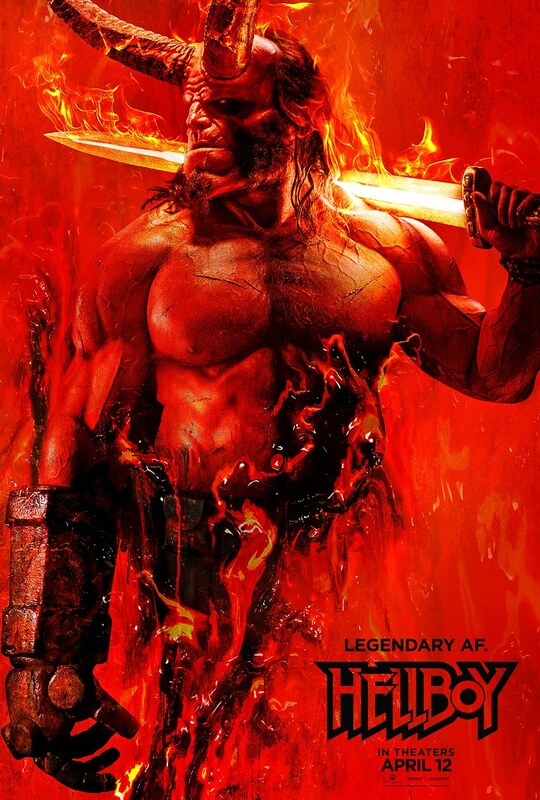 When is the Hellboy release date? Hellboy is out in cinemas in both the UK and US now. The film was first expected in 2018, then re-scheduled for 11 January, before settling on a 12 April release. The main star is David Harbour, best known in recent years for his role as Sheriff Jim Hopper in Netflix's Stranger Things, though he's also appeared in the likes of Suicide Squad, The Equalizer, and TV show The Newsroom. Opposite him will be genre legend Milla Jovovich as the film's villain, Nimue the Blood Queen - and in fact the film originally had the working title 'Hellboy: Rise of the Blood Queen' before it opted for the simpler 'Hellboy'. Filling out Hellboy's corner will be Ian McShane as Professor Bruttenholm, founder of the Bureau for Paranormal Research and Defense (BPRD); Daniel Dae Kim as Ben Daimio, a BPRD agent who can transform into a jaguar; and Sasha Lane as Alice Monaghan, a woman Hellboy rescues from the fae who might become a bit of a love interest. Interestingly, Dae Kim wasn't the original actor cast to play Daimio. The role first went to Ed Skrein, who withdrew from the project after a backlash over the whitewashing of a character written as Japanese-American in the comics (Dae Kim is Korean-American, which is a bit closer). Elsewhere, Penelope Mitchell will play Ganeida, a witch who turns against Nimue, while Sophie Okonedo and and Alistair Petrie will both play members of the elusive Osiris Club, an ancient English organisation devoted to supernatural mysteries. Finally, Brian Gleeson will make an appearance as Merlin. Yeah, that one. It looks like there's no sign of either Elizabeth Sherman or Abe Sapien, two of the comics' staple BPRD agents and key cast members in Del Toro's films - presumably an attempt to distance this reboot slightly from the previous two films. Who are the writer and director? Taking the unenviable position of following on from Del Toro is British director Neil Marshall. He made his name with ace low-budget horrors Dog Soldiers and The Descent, before spending most of the last decade working in TV, including directing some of the biggest, most complex episodes of Game of Thrones, Westworld, and Hannibal, proving along the way that he can handle action scenes just as well as horror. He'll be directing a script written by Andrew Cosby, though early drafts were shepherded by Hellboy creator Mike Mignola and novelist Christopher Golden. If you haven't heard of Cosby, he's mostly a comic book writer, but was also the co-creator of the Syfy series Eureka and has a number of other TV and film projects on the way. 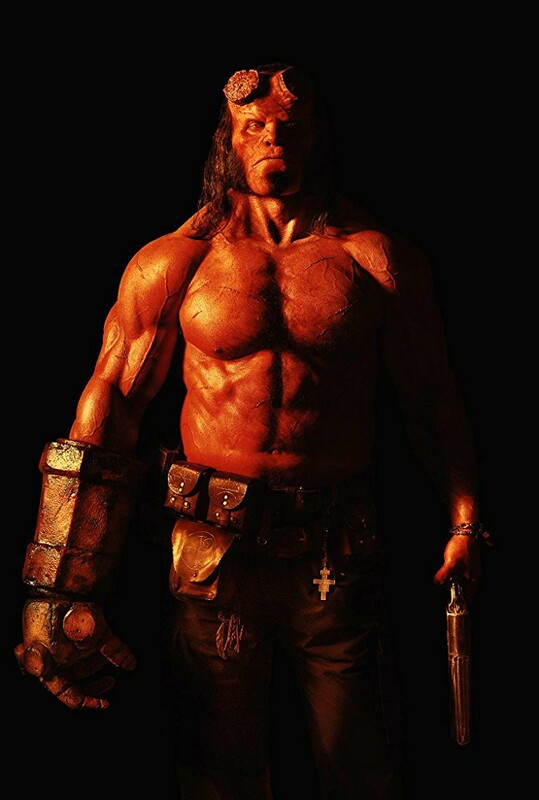 We also have a few more photos of Harbour in full Hellboy get-up: one official colour promo shot, one moody black-and-white number, and one exciting 'running down a hallway' shot from Empire Magazine. Between the trailer, casting news and Hellboy comics lore we can make a few guesses about what the plot of the film will be. Jovovich is playing the villainous Nimue, a.k.a. the Blood Queen, a medieval sorceress who basically wants to do evil. She first appeared in the Hellboy comic books in 2008’s 'The Wild Hunt' storyline, where she was a powerful witch from the age of King Arthur who betrayed Merlin. In that story other witches banded together to stop her, cutting her body up and separating the pieces around the world to prevent her coming back to life - which, lo and behold, she eventually manages to do anyway, leaving Hellboy to deal with her in the present day. It sounds like echoes of that plot will be present here too, as Penelope Mitchell's Ganeida is supposedly a witch who helps Hellboy and the BPRD take down Nimue, believing her wrath has gone on for too long. They'll likely also get help - or just intel - from the Osiris Club, an English organisation from the comics devoted to understanding the occult. The later storyline 'The Storm & The Fury' will also probably play an influence: that loose follow-up introduced Alice Monaghan, Sasha Lake's character in the film, and also featured an appearance from Merlin himself - expected to be played by Brian Gleeson on-screen. From the NYCC trailer and panel, we know that Excalibur will feature, and it looks like that moody poster of him wielding the sword with full grown horns is actually drawn from the film - reports say that image was the trailer's money shot. Regardless of the story specifics, there's one thing that Harbour, Marshall, and Mignola alike have all been clear on: this will be a darker, moodier take on the material than Del Toro's films, closer in tone to a horror film than a fantasy romp. "Neil [Marshall] said from the very beginning that he wanted to walk a razor's edge between horror and comic book movie, which was music to my ears, because that's what I was shooting for in the script, and precisely what Mignola does so well with the comics," screenwriter Cosby has said of the film. Original creator Mike Mignola echoed those thoughts in an interview with Newsarama. "Where Hellboy II: The Golden Army was a light fantasy film, this will be very much darker – close to a horror film," said Mignola. "I’ve met some people doing pre-production, and I visit the person doing the creature effects. I’m very happy with what I’ve seen so far: I give them my two cents, then get out of the way. But I’m very happy they’re asking my opinion, and giving me opportunities to solve certain creative problems." It's also skewing for an R-rating (so likely a 15 in the UK), with Hellboy blowing off people's heads with a shotgun in the NYCC trailer, and similarly dark stuff expected in the final cut.